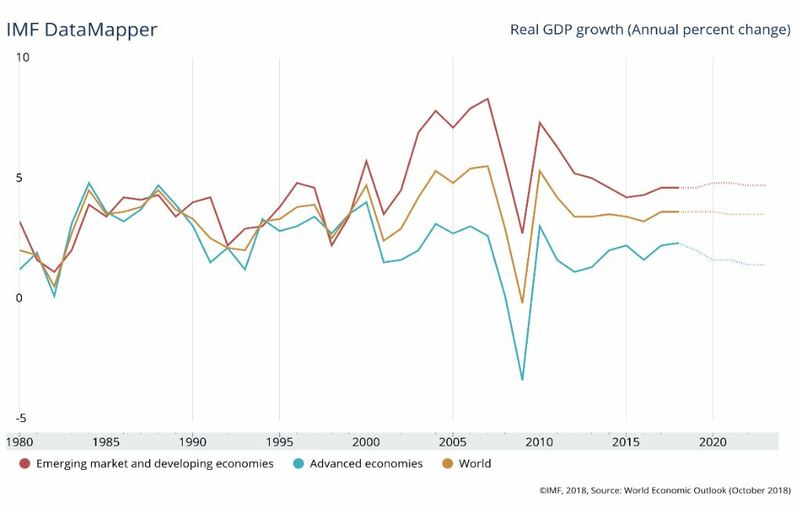 Conclusion: Global economies are slowing but unlikely to enter a recession in 2019, providing support for U.S. financial markets. Market performance around the world is likely to be positive though with mixed results across developed and emerging economies. Energy takes the lead with an impressive year-to-date return over 23%. 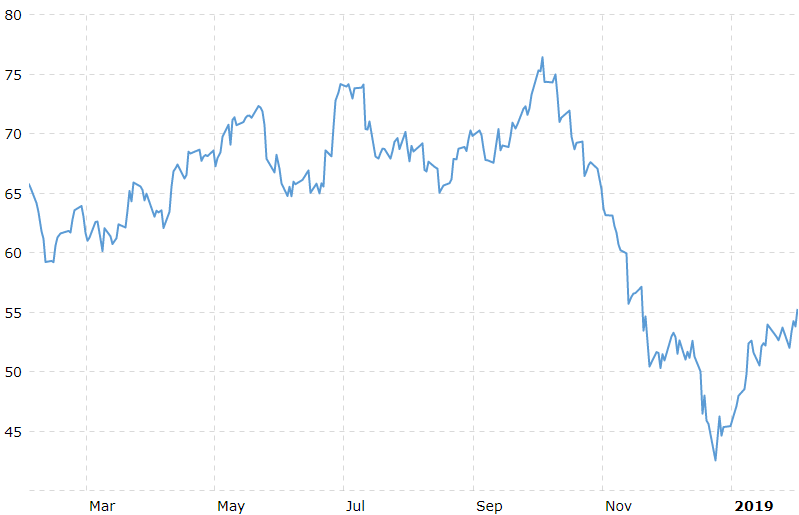 2019 started with a roar as commodities streaked off the starting line, gaining 13.14% in January and February (combined). 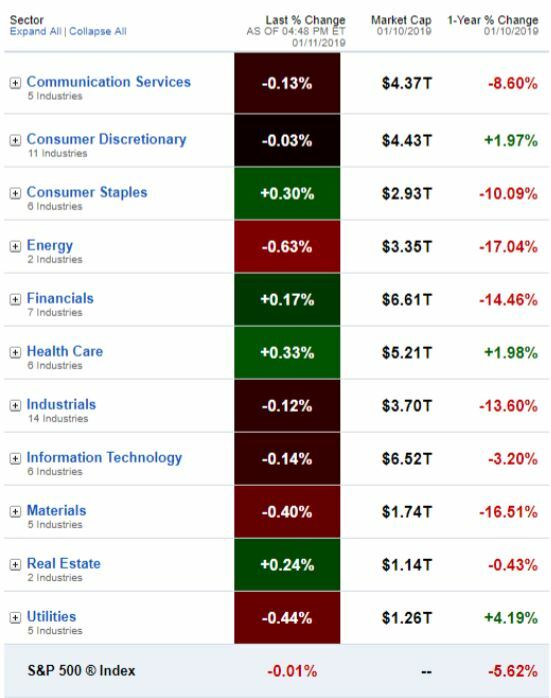 The biggest winner was the Energy sector leaving everything else in the dust with an impressive 23.48% return. 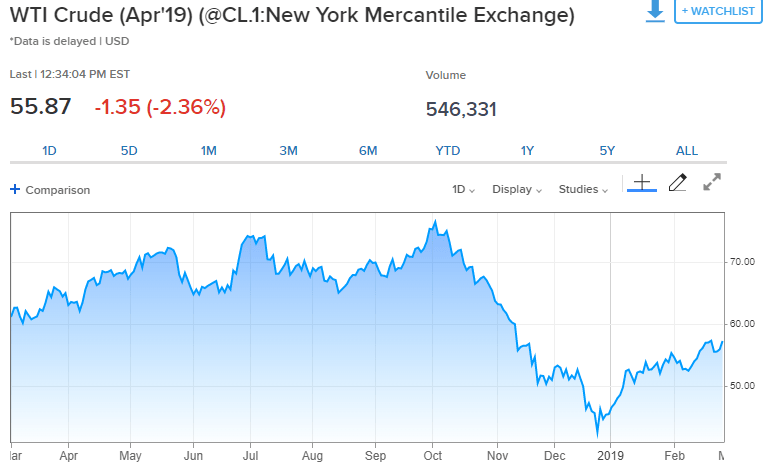 The rebound in oil prices was fueled in part by ongoing supply reductions by OPEC and diminishing trade tensions between the U.S. and China. Going forward, U.S. shale oil production capacity should keep a lid on oil prices despite efforts by OPEC countries to keep prices higher. Global stocks were not left in the dust. Despite the recent downturn, the S&P 500 is on pace for its strongest start in recent memory. This impressive performance was felt broadly across market sectors, led by Industrial companies and followed closely by Energy, Technology, and Consumer Discretionary firms. 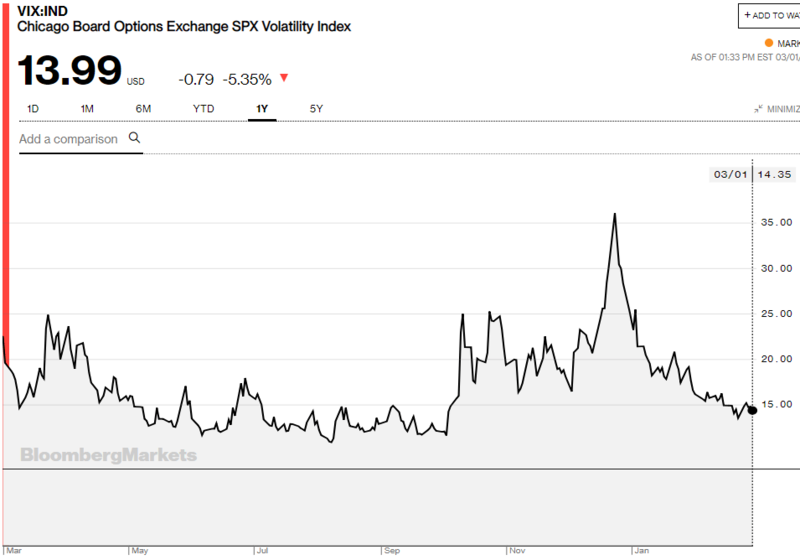 Thankfully, U.S. stock market volatility as measured by the Chicago Board Options Exchange Volatility Index (VIX) calmed down from the frantic pace of the 4th quarter, perhaps due to investor fatigue as much as anything else. 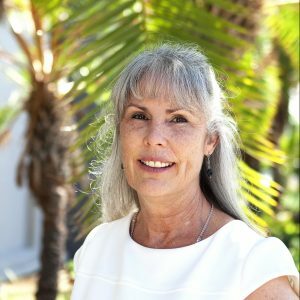 In truth, news has indeed gotten better: the FOMC indicated it would remain patient with the pace of normalizing interest rates; trade negotiations with China are progressing toward a workable conclusion; and corporate earnings for the 4th quarter are coming in better than investors feared. International stocks are also benefiting from economic and political tailwinds, pulling slightly ahead of the U.S. in February with a return of 3.58% versus 3.21% for the S&P 500. The U.S. remains in the lead year-to-date: +11.48% compared to +9.57% for the developed markets equity index (MSCI ACWI.) 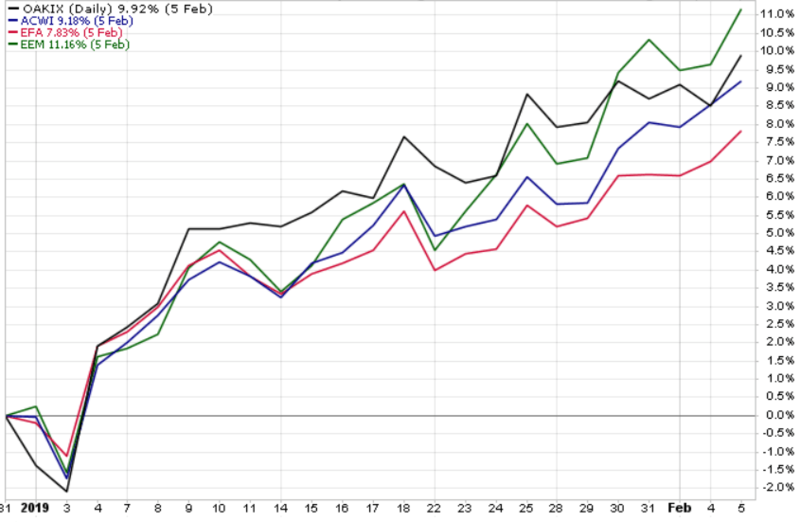 Emerging Markets stocks are solidly in the middle of the pack at 0.22% in February and 9.01% year-to-date. U.S. bonds lagged the field with a negative return of -0.06% in February and 1.0% year-to-date, despite over $25 billion of inflows from mutual fund investors fleeing the stock market volatility of the 4th quarter 2018. As reported in the Wall Street Journal and calculated by Dow Jones Market Data, the U.S. stock market continues in the same direction it started 64% of the time. Whether this relationship will apply in 2019 depends to some degree on the cause of the strong start. 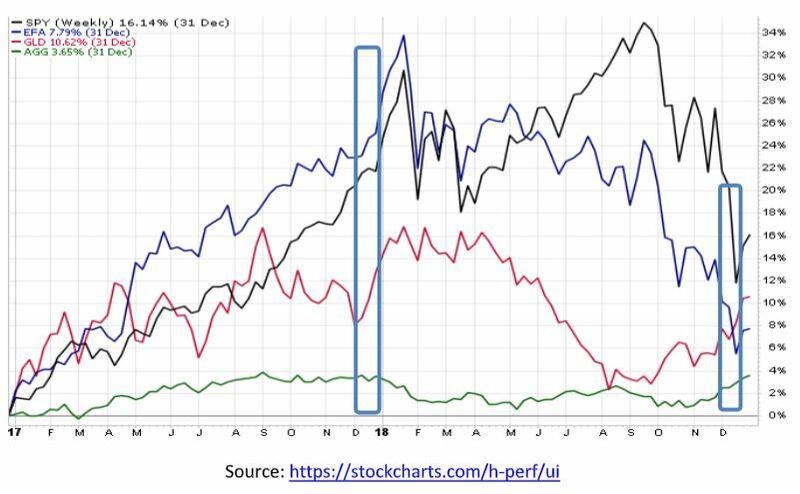 Given the sharp sell-off in the 4th quarter of 2018, some of the rally in early 2019 is likely attributed to stock prices finding a more rational foundation after being oversold, with the remainder based on fundamental factors outlined above. These aren’t powerful reasons for the rally to continue the rest of the year, but no reason to decline either. It is encouraging to see Industrials leading the way rather than Technology, as the returns of industrial companies tend to be more closely tied to longer term economic trends. 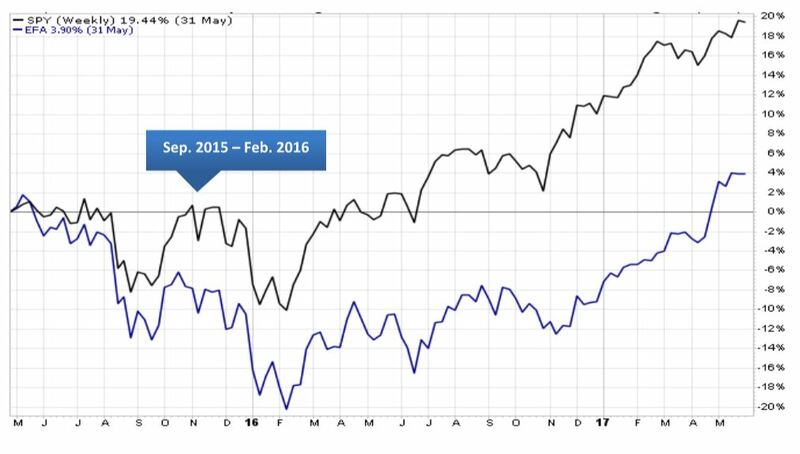 The breadth of the rally is also hopeful, as the number of stocks rising versus falling each day hit new highs in February. 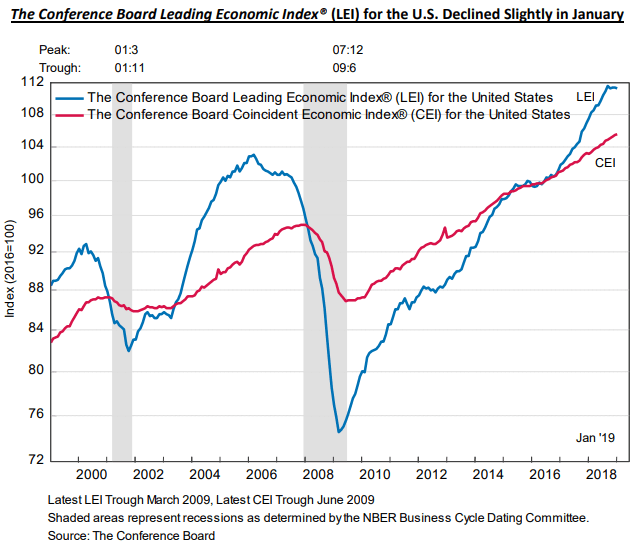 Another bright spot is the Conference Board’s ‘Leading Economic Indicators’ index which remains strong despite declining a bit in January. On the less optimistic side of the equation, most S&P 500 companies are forecasting earnings growth to slow in 2019. Overseas, economic tensions persist as the U.K. has yet to come up with a ‘Brexit’ deal acceptable to both the European Union and the British Parliament, and trade tariffs are hitting European automakers particularly hard. Add to this the worrisome growth of debt among many public and private entities worldwide, including the U.S. government, leaving central banks with less flexibility if the global economy stumbles. The International Monetary Fund recently published an eye-opening study about the amount of debt accumulated around the world. 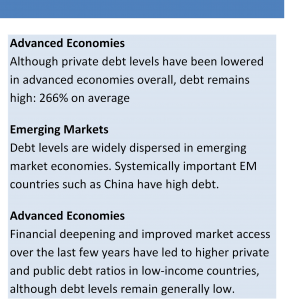 (see chart below) The large light blue circle in the ‘Advanced Economies’ section at the top of the chart represents U.S. public and private debt at 256% of GDP. Japan is the green circle at the top right with nearly 400% debt to GDP(! 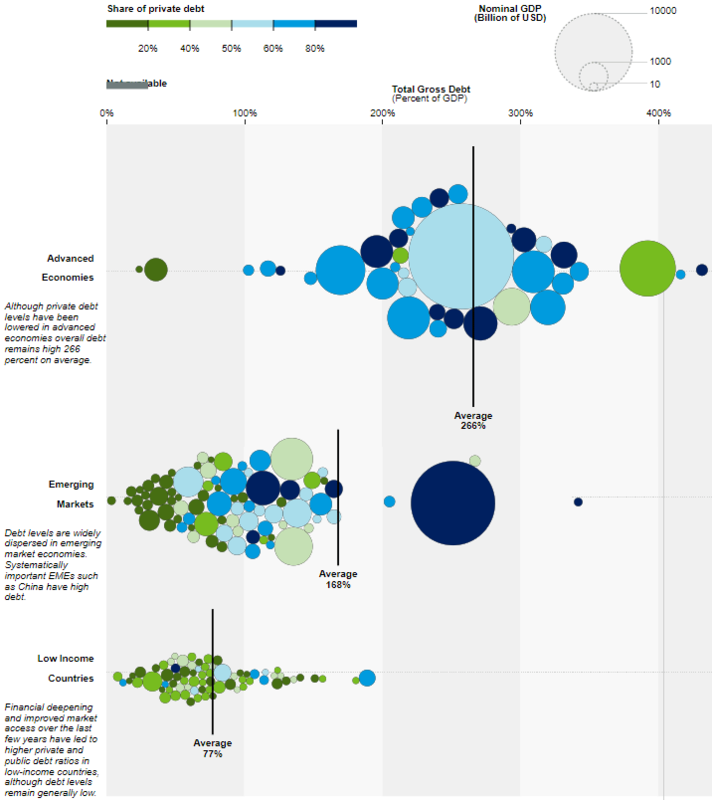 ), and Germany is the medium blue circle at the top left with 171% debt. The dark blue circle in the middle ‘Emerging Markets’ section represents the debt load of mainland China at 254%. The lower section reflects ‘Low Income’ countries including Bangladesh, the light blue circle in the middle with 76% debt, and Vietnam in dark blue at the far right of this group with 189% debt to GDP. Is all this debt a problem, especially for the U.S. government with over $22 trillion debt outstanding? 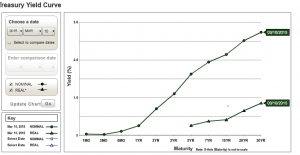 You might be comforted to know that though the U.S. government debt load is growing ever higher – due in some part to the ever-expanding U.S. economy – the interest servicing cost is only 1 ½% of GDP, compared to about 3% of GDP in the much higher interest rate environment of the 1980s and 1990s. As long as government borrowing and spending doesn’t ‘crowd out’ the private sector capacity to lend and spend, the debt shouldn’t be a problem. However, if government debt becomes so large that the government’s need to borrow pushes up interest rates for the rest of us, the economy could slow, kicking off a vicious cycle of unsustainable borrowing to keep the economy afloat. But there’s no need to panic just yet! 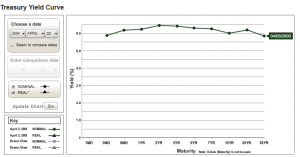 Government debt is nowhere near the danger level and is unlikely to get there any time soon. How do we weigh the positive and negative economic data? On balance, there is enough positive data to support the case that a recession is not on the horizon. This outlook is becoming more widely held, which should enable the financial markets to hold their position and cross the finish line in positive territory by the end of 2019. As always, the investment team at Warren Street Wealth Advisors will keep a sharp lookout for confirming or contrary evidence as the year unfolds, and will base our investment decisions on the best information we can find. While the future remains unclear, we promise to keep you informed as we journey forward. 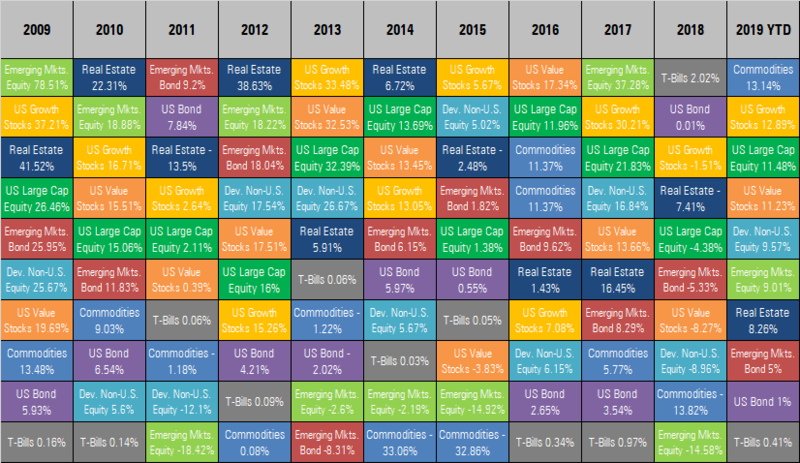 All major asset classes were up strongly in January, one of the best yearly starts in recent memory, despite the month-long partial government shutdown in the U.S., continuing uncertainty about trade tariffs’ impact on international growth, and the failure of U.K. ‘Brexit’ negotiations. 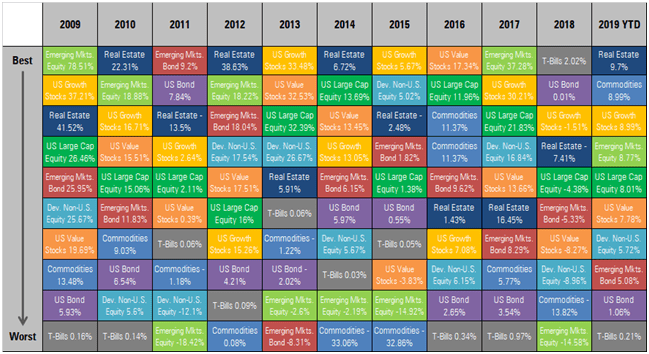 Global real estate took the lead among major asset classes with a monthly return of 9.70%, followed by commodities and U.S. growth stocks at 8.99% each. The S&P 500 gained 8.01% for the month, with emerging markets equities up 8.77% and developed international equities up 5.72%. U.S. bonds also had a strong month, rising 1.06%. Among commodities, crude oil prices led the way with a strong rebound from the December 24th low of $42.53, ending the month at $53.79. The S&P GSCI Agriculture index, the second largest component of the S&P GSCI index, stabilized after declining steadily in recent years. International equity markets are well priced for future growth. Emerging Markets equities (EEM) led the international equity markets in January, followed by the MSCI All Country World Index (ACWI), with Europe, Australasia, and Far East (EAFE) markets not far behind. European markets posted solid returns despite Prime Minister Theresa May’s Brexit plan being voted down by Parliament. After the Brexit agreement was rejected, Prime Minister May survived a ‘no confidence’ vote and promised renewed efforts to negotiate an acceptable exit plan with European Union leadership. According to Harris Associates, manager of the Oakmark International fund, international markets have been the victim of “overly emotional equity markets” in recent months and U.K. businesses are generating the highest percent free cash flow in the world (6%). Prominent companies such as Daimler, Lloyds, and Tencent are trading at significant discounts to intrinsic value, and the Oakmark International portfolio has a Price/Cash Flow ratio of 4.8x compared to 7.5x for the world, indicating the shares held in the fund are priced significantly lower than the world markets. Worries about a near-term recession in the U.S. receded as corporate earnings continued to grow in the 4th quarter of 2018 and employers added more new jobs than expected. 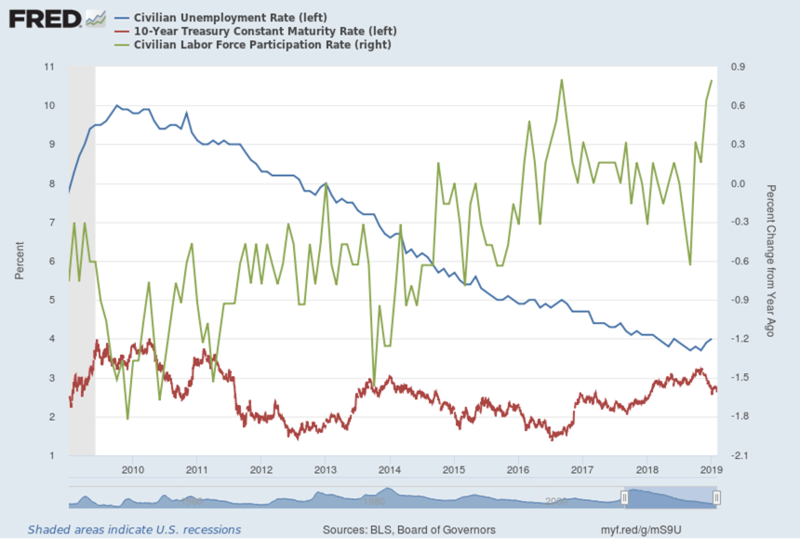 Unemployment in the U.S. remained near historic lows, edging up to 4% due to the temporary addition of government workers furloughed during the partial government shutdown. The labor participation rate continued to increase slowly and job creation exceeded expectations in January with 304,000 jobs added. Fears of rising interest rates derailing the U.S. economy diminished with Federal Reserve officials holding short-term rates steady at their January meeting and commenting on being ‘patient’ with future interest rate increases. As presented Natixis National Sales Meeting January 10, 2019 Source: Corporate Reports, Empirical Research Partners Analysis as of November 30, 2018. Excluding financials and utilities; data smoothed on a trailing six-month basis. 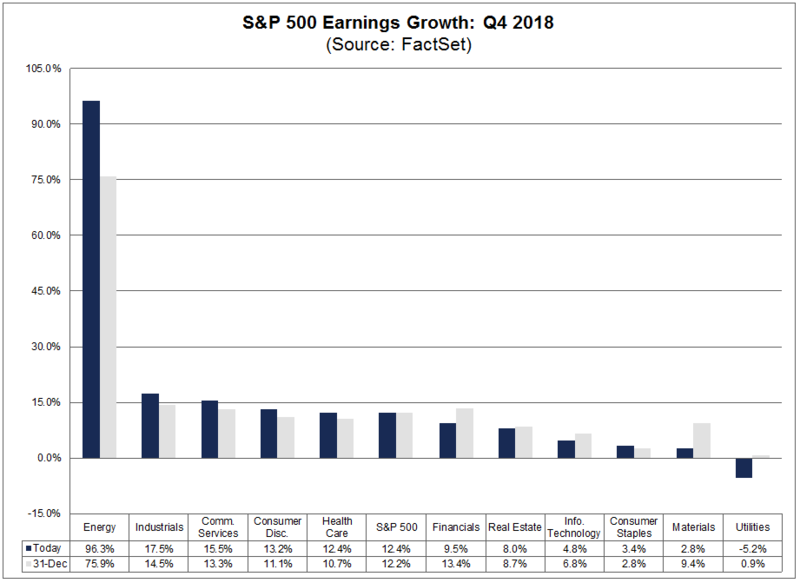 Corporate earnings for the 4th quarter were generally near the 5-year average with 10 of the 11 S&P sectors reporting year-over-year earnings growth. 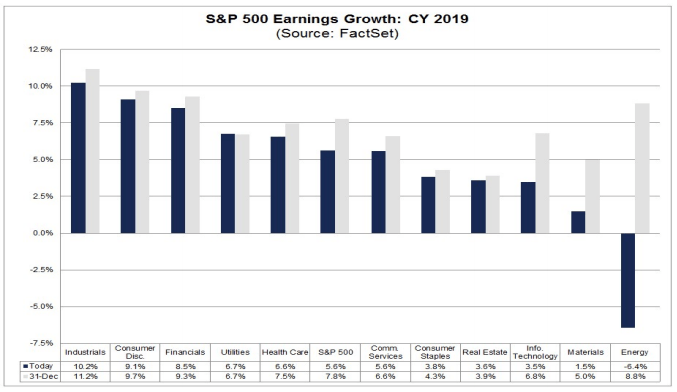 Energy, Industrials, and Communication Services led the way with double-digit growth rates in the 4th quarter, though earnings estimates for 2019 are trending lower across most sectors. The investment team at Warren Street Wealth Advisors held the line through a difficult 4th quarter of 2018, reaping the reward with a strong start to 2019. Despite some negative headlines in December, the U.S. economy does not seem poised for a recession and we will remain fully invested across market sectors until evidence to the contrary becomes clear. With the Federal Reserve cautious on raising interest rates, job growth and wages increasing, and trade talks moving forward, we expect market volatility in 2019 to settle closer to historic norms, though not without some bumps along the way. Despite recent weakness in overseas markets relative to the U.S., we are strong in our conviction that international markets are poised to rebound as stock prices stabilize at attractive levels, particularly in Europe and Emerging Markets, and negative headlines diminish. While economic and fundamental data appear mixed globally, we continue to be broadly diversified as international markets work through the next phase of political and economic developments. As always, if you have any concerns or questions, the investment and financial planning teams at Warren Street Wealth Advisors want to hear from you! Call, write, or drop by our Tustin or El Segundo offices any time. We are here to help. Though the U.S. stock market closed the year with its first annual loss since 2008 (S&P 500 -4.38%)(1), investors retained the vast majority of gains earned in 2017 (21.83%.) International stocks as measured by the MSCI EAFE(2) index were down -8.96%, giving up just over half of 2017’s gains (16.84%), and the Barclays Aggregate U.S. bond index ended the year flat at +0.01% after a very strong November and December. 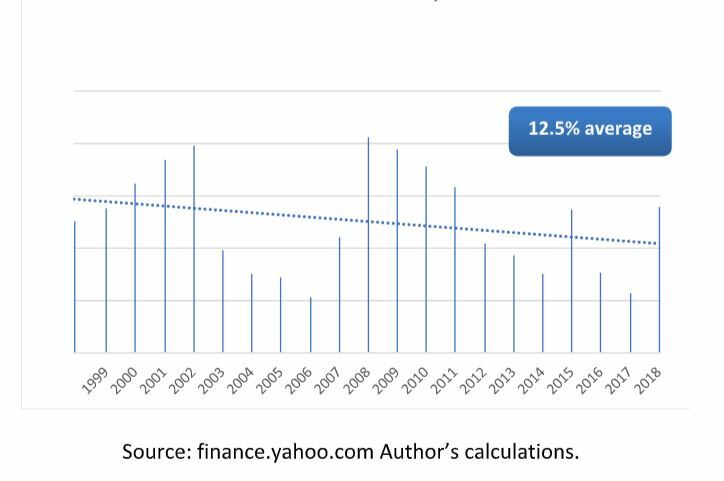 Though market turbulence in the 4th quarter felt extreme, volatility over the year didn’t approach the peaks seen after the Dot Com bubble burst in 2001-2002 or during the financial crisis of 2008-2009. Global financial markets tend to exhibit a ‘sector rotation’ pattern of recent losers becoming the next period’s winners. If the pattern holds true, international stocks are poised for a strong year in 2019. 2018’s poor performance followed an unusually steady 10-year period of growth. Investors bold enough to put their money at risk after the market plummeted in 2008 were handsomely rewarded. Investors willing to do the same in 2019 may be rewarded once again. It wasn’t pretty, but the year is finally over and we already see indications of better times ahead in 2019. Though the U.S. stock market closed the year with its first annual loss since 2008 (-4.38%) , investors retained the vast majority of gains earned in 2017 (21.83%) and the previous 9 years of recovery post the 2008 financial crisis. Though European stock markets fell behind the U.S. last summer and never caught up, these markets also ended 2018 well ahead of where they started in 2017. International stocks as measured by the MSCI EAFE index were down -8.96% in 2018 compared to +16.84% in 2017, and U.S. bonds ended the year flat after recovering strongly late in the 4th quarter. Market sectors which lagged in the strong quarters, especially bonds (AGG) and gold (GLD), provided welcome relief during the 4th quarter downturn. International stock markets avoided some of the December tumble and rebounded into January 2019, easing some of the pain from lagging the robust U.S. market earlier in the year. The return of stock market volatility in the 4th quarter surprised investors, especially compared to an unusually stable 2017. 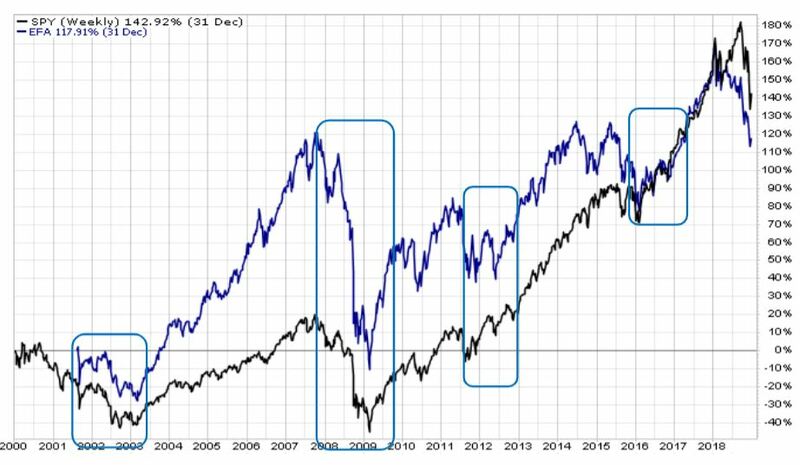 Just as periods of stability are often followed by turbulence, extreme market moves are commonly followed by reversion toward the mean (average). This tendency is illustrated by the two charts below. 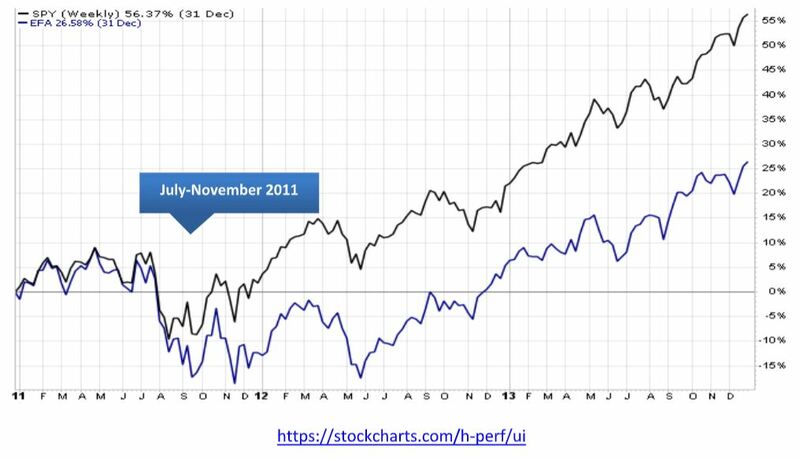 The first chart shows the drop in the SPY and EFA ETFs in the period between July-November 2011. Notice the jagged ups and downs just after the drop, followed by a fairly steady up-trend through 2013, though not without some negative surprises along the way. We see a similar pattern in the 4th quarter of 2015 before the start of the bull market of 2016-2017. And while the downturns are painful, they tend to be relatively brief compared to the recovery period. Asset class returns tend to follow a ‘sector rotation’ pattern with prior period winners commonly falling in the rankings in subsequent periods, and prior period losers tending to rise in the rankings. Though historical context is helpful, we need to face forward when making investment decisions. Following the crowd and expecting history to repeat itself without considering the underlying drivers of returns isn’t likely to be a successful strategy in the coming year. Though market conditions vary from year to year, the investment team at Warren Street Wealth Advisors believes international stocks in particular have been hit by political and economic ‘headline risk’ more than actual financial distress. Many European companies such as BNP Paribas (one of the largest banks in Europe), Daimler (maker of Mercedes Benz), and Lloyds Banking Group (a leading U.K. financial service firm) are poised for a strong rebound in 2019. In emerging countries, stalwart firms such as Samsung and Taiwan Semiconductor remain solid global players, with disruptors such as Alibaba and Tencent making their presence felt beyond their home base in AsiaPacific. Another important thing to remember is that the stock market is not the real economy. Fundamental strength in corporate balance sheets should keep the global economy, and the markets, positive in 2019. GDP reflects the value of goods and services produced in a country – ultimately, GDP reflects corporate earnings. Robust U.S. GDP growth early in 2017 led to tight labor markets and rising inflation, supporting the Federal Reserve’s plan to ‘normalize’ short-term interest rates(3). Though GDP growth is expected to slow in 2019, the Federal Reserve forecasts a positive growth rate of approximately 2%. Not stellar, but certainly not in recession territory. And not so strong as to require the Fed to increase their pace of raising short-term interest rates, since modest GDP growth is unlikely to spark inflation. 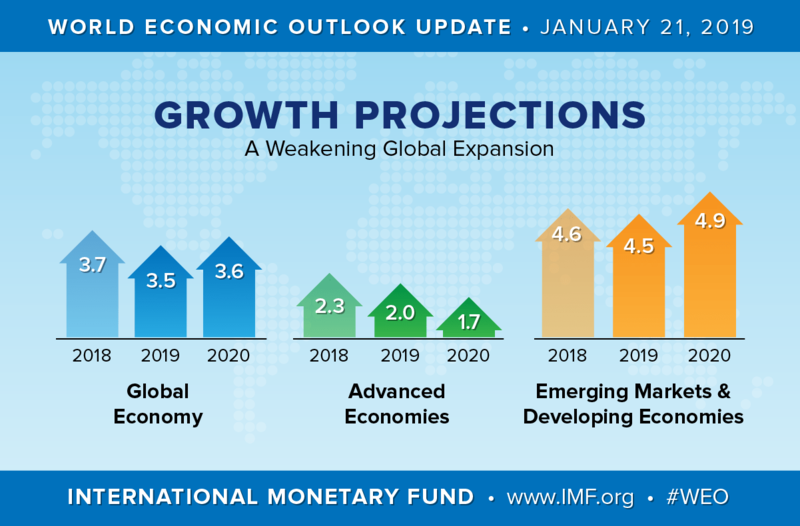 The International Monetary Fund is projecting similar modest positive growth for developed nations, and near 5% growth for emerging economies. Economic fundamentals should ultimately find their way into stock prices, but the markets often become overly optimistic or pessimistic along the way. As we mentioned in our November commentary, S&P 500 corporate profits were very strong in the 4th quarter of 2018. And for the calendar year, growth in corporate profits was 20.3% due in part to the reduced corporate tax rate(4). This is the highest growth rate we’ve seen since 2010 when profits jumped nearly 40% coming out of the Great Recession of 2008-2009. All 11 sectors of the S&P 500 reported positive growth for the year, with 9 of the 11 sectors reporting double-digit growth. You might be surprised to see that Energy companies reported the highest calendar year earnings growth of all the 11 sectors. Despite the 4th quarter fall in oil prices, oil has actually increased when compared against the prior year-end. Materials and Financials also posted strong earnings growth in 2018, a fact not reflected in their December closing stock prices. 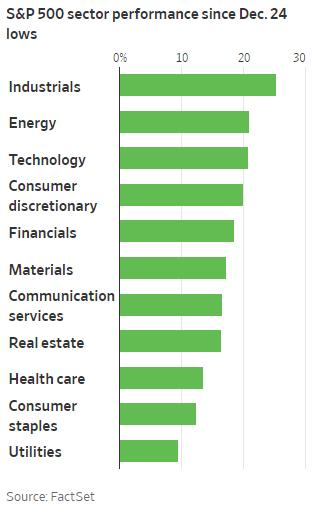 As shown in the chart above from Fidelity Research(5), the biggest losers in the S&P 500 were not Technology companies which were grabbing most of the news headlines, but rather Industrials, Financials, Materials, and Energy firms. Industrials and materials were hard hit by concerns over trade tariffs and a slowing, though still strong, pace of new home building(6). Energy equipment and services firms suffered from falling oil prices hurting profit margins. Financial firms also struggled as increasing short-term funding rates squeezed investors’ profit expectations. Conclusion: Though we can’t predict the future, periods of extreme market movements are often followed by reversion toward the mean. The underlying economic data remains solid and sooner or later investors will incorporate this reality into global stock and bond prices. 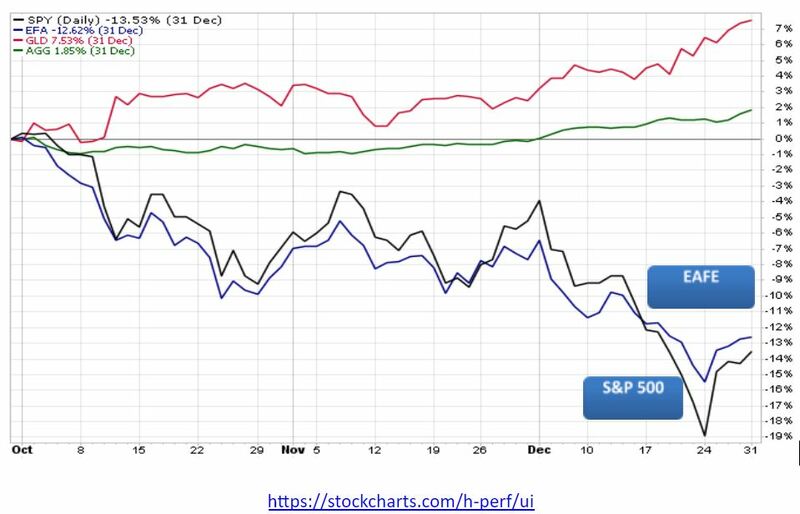 In the meantime, the investment team at Warren Street Wealth Advisors is watching the data, rebalancing into weakness, and looking forward to a smoother ride in 2019. 78% of S&P 500 companies reported positive earnings surprises. A survey of large corporations indicated an expectation for EPS to slow somewhat in 2019 from the current high levels. 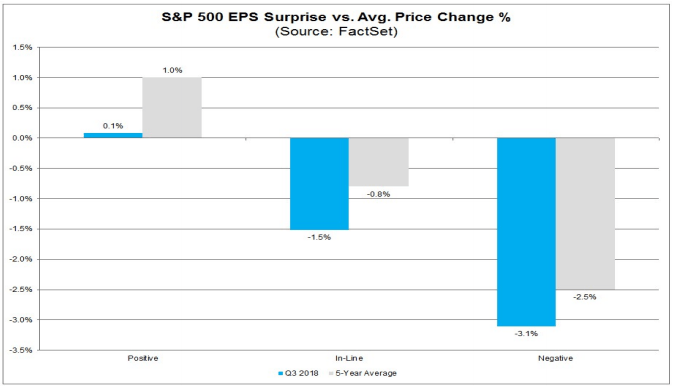 The U.S. stock market is not rewarding positive surprises as much as usual and is punishing negative surprises more than usual, resulting in lower lows and not-as-high highs as might be expected. The Fed’s mission to bring short-term rates to more ‘normal’ levels is narrowing the difference between short- and longer-term interest rates (a ‘flat’ or ‘inverted’ Treasury yield curve.) Muted inflation expectations and investor ‘flight to quality’ is keeping demand for long-term bonds high, putting downward pressure on yields. Neither of these factors indicates a recession is imminent. Conclusion: The U.S. economy isn’t going into a recession, it’s just taking a bit of a breather. The stock market will eventually recognize this and stabilize, but it may take a few more months. Finally! A month of positive returns for the global financial markets. Uncertainty eased a bit in November as midterm elections were completed with no big surprises, talks of trade wars continued without significant escalation, and Fed Chairman Jerome Powell indicated interest rates were nearing a neutral point. What a relief! Not that the month was pretty, it was far from it, but at least we ended up higher than where we started. Of course, there are still things to worry about. According to the World Bank¹, energy-related commodities dropped 15.4% in November as OPEC and other oil-producing countries failed to limit supply. European banks and automakers continued to struggle amid news of the German financial giant Deutsche Bank being accused of money laundering. Here in the U.S., General Electric is battling CEO drama, debt issues, and anemic revenues. General Motors announced plans to close some of their factories. These events are certainly worth keeping an eye on but aren’t likely to kick the feet out from under global economies. So if the economy is doing OK, why is the stock market so jittery? When all is said and done, stock prices should reflect expectations of future profits. 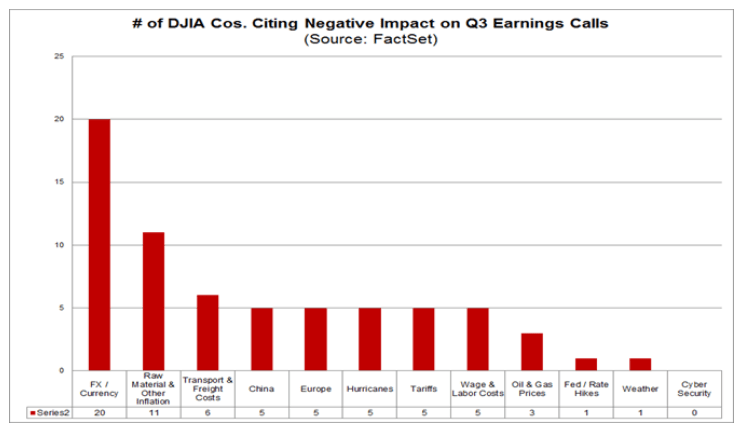 According to a recent article published by FactSet², the most commonly reported factor negatively impacting corporate earnings in the 4th quarter wasn’t trade tariffs or rising interest rates like we’ve heard from market commentators, but rather the strength of the U.S. dollar. The next most mentioned factor was the rising costs of raw materials and labor. Despite these headwinds, corporate profits have been strong. We also were told earlier in the year that the markets were ‘fully valued’ or ‘expensive’ relative to historical norms. One positive outcome of the market corrections in October, November, and early December is that stock prices are now well within the normal range for fair value. 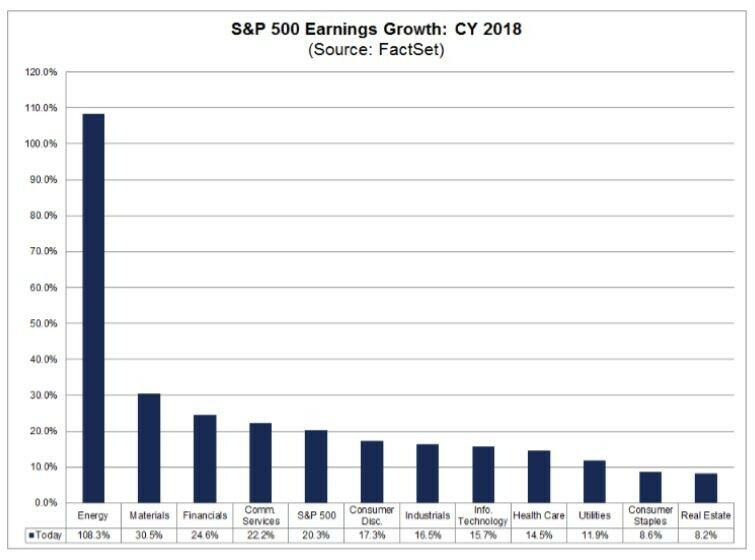 The blended earnings growth rate for the S&P 500 is 25.9%. 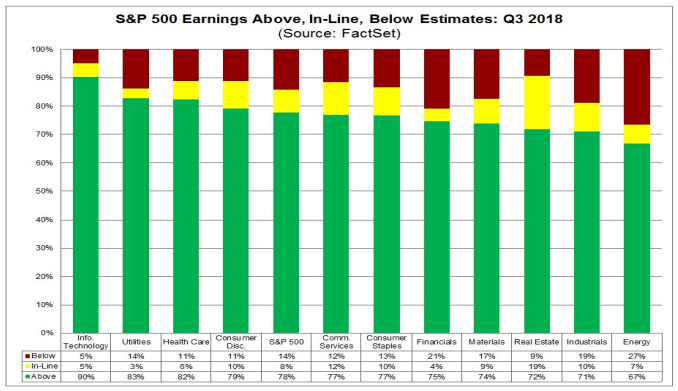 If 25.9% is the actual growth rate for the quarter, it will mark the highest earnings growth since Q3 2010. All eleven sectors have higher growth rates than the 3rd quarter due to positive EPS surprises and upward revisions to EPS estimates. OK, maybe the stock market is overreacting. But what’s this we hear about the ‘inverted yield curve’ forecasting that a recession is imminent? 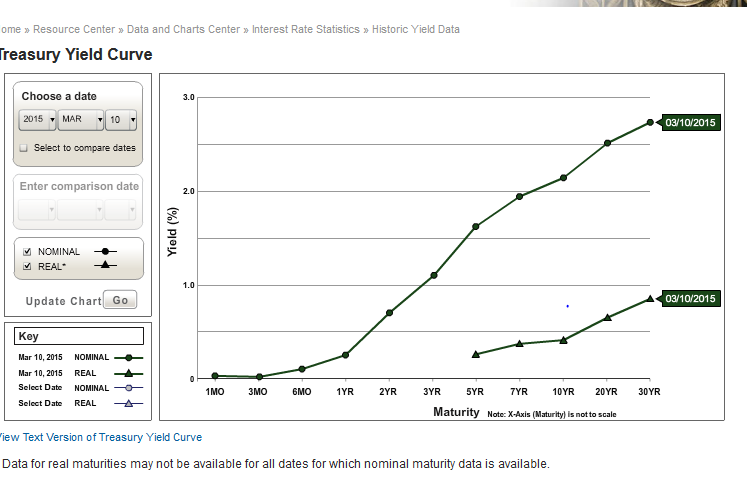 A ‘yield curve’ is a graphical depiction of market-based yield-to-maturity for bonds with different maturity dates. The curve is usually upwardly sloping, meaning that lenders and investors require higher returns the longer they have to wait to get their money back. Over the past year, the difference between the 10-year and 2-year Treasury yields has been getting smaller and smaller, causing the yield curve to ‘flatten’. 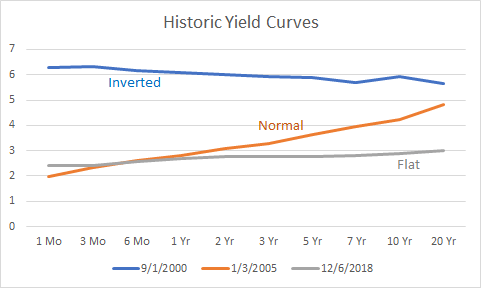 If short-term bond yields become higher than longer-term yields – an ‘inverted’ yield curve – investors interpret this as a signal of a coming recession. What you don’t hear in the news is that yield curve inversion has preceded recessions by up to 2 years, which isn’t much of a prediction. When you add the observation that there have been more yield curve inversions than recessions, perhaps we should take a closer look at the ‘cause’ of the yield curve inversion before we jump to the ‘effect’. GDP (Gross Domestic Product) is the value of goods and services produced in the U.S.
By definition then, corporate profits have to slow substantially for GDP growth to become negative. Right now employment is strong, wages are growing, and corporate profits are solid. As long as people have jobs, they tend to buy stuff. As long as people buy stuff, corporations will be profitable. If corporations are profitable, GDP growth should remain positive. 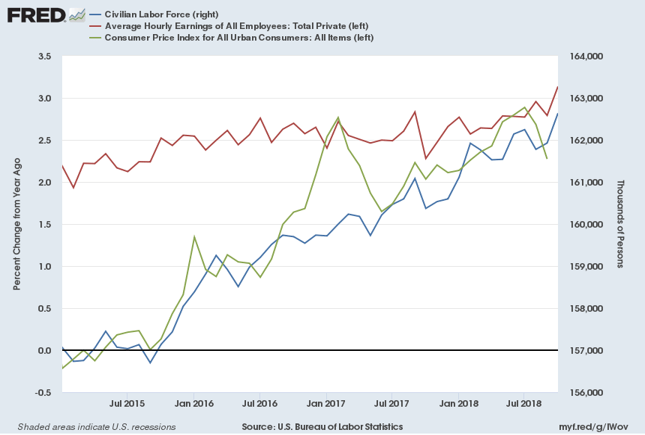 Given everything we see in regard to the current macroeconomic environment, the investment team at Warren Street Wealth Advisors expects slow and steady growth to continue at least through summer of 2019, and probably longer. As long we can dodge potential catastrophes caused by weather, wars, or geopolitical events, there’s no reason for the U.S. economy to fall into a recession. 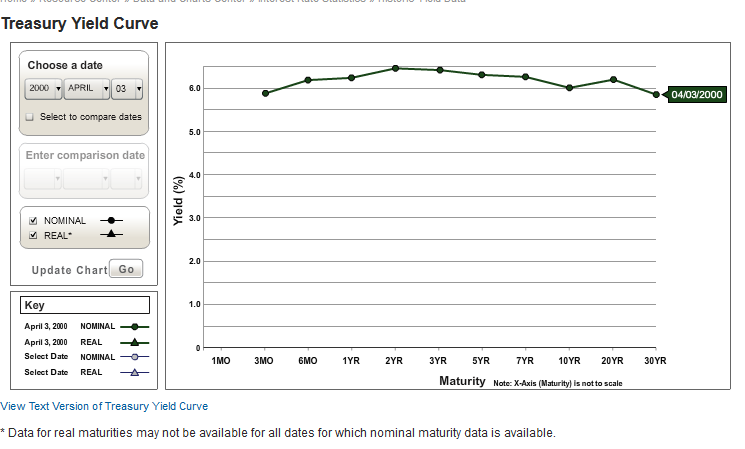 So if the economy isn’t going to stall, what’s with the inverted yield curve? There’s nothing mysterious about why short-term rates are going up – the Fed is pushing short-term interest rates back to ‘normal’ levels. The question then revolves around why long-term rates aren’t going up as much. Long-term Treasury rates aren’t set by the Fed, but by the willingness of investors and businesses to borrow and lend. This willingness is driven by 1) economic growth, 2) inflation expectations, and 3) risk appetites. What kind of risk am I talking about? Market risk. With the wide swings in the stock market in recent months, we’ve seen a ‘flight to quality’ away from stocks and toward the safety of Uncle Sam. 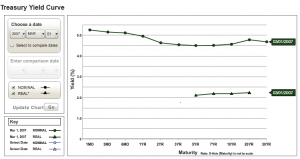 More demand for Treasury bonds leads to higher prices, and when bond prices rise, yields fall. 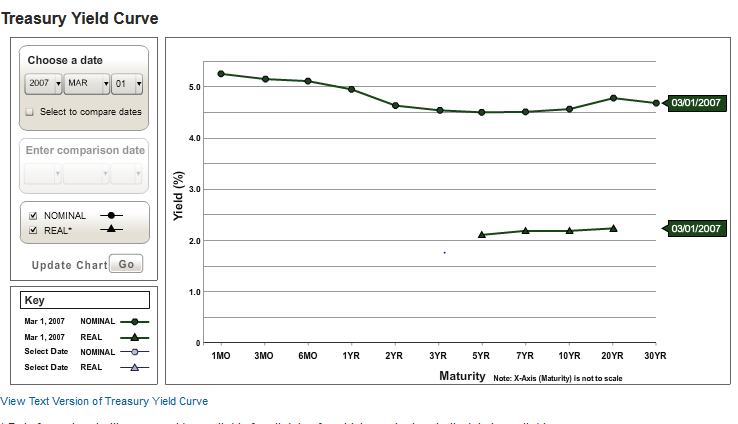 With short-term rates moving up due to Fed actions and long-term rates staying low due to market forces, the yield curve flattens. It isn’t recessionary, it’s just simple supply and demand. In fact, if you look at corporate bond yields instead of Treasuries, longer-term yields have indeed been rising as the Fed increases short-term rates. There’s really only one conclusion to draw from the available evidence. The U.S. economy isn’t going into a recession, it’s just taking a bit of a breather. While the markets adjust to this new reality, investors are getting tired of enduring the huge swings in stock prices. 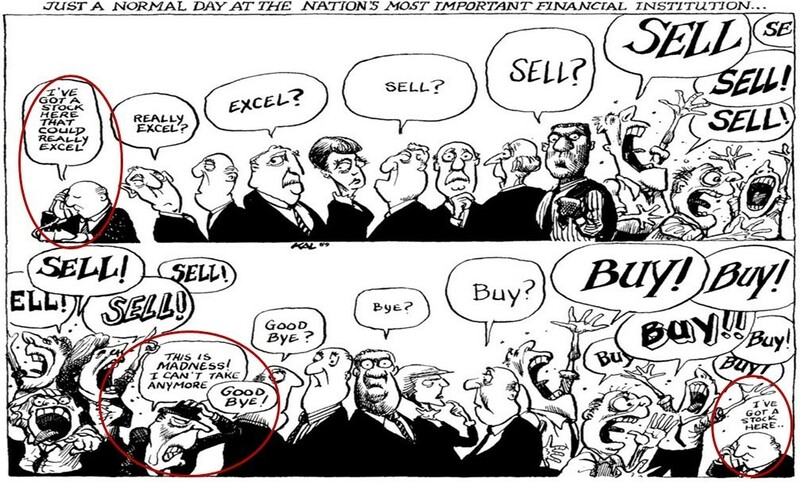 When investors stay on the sidelines and stop ‘buying the dips’, stock prices have trouble finding a floor. Hence the tendency for the market to fall by hundreds of points on news headlines, whether the information impacts long-term profits or not. What should we do now? The investment team at Warren Street Wealth Advisors is buckling our seatbelts and holding on tight as we speed toward a turbulent year-end close. We’re confident that the fundamental strength of U.S. and global economies will win out eventually, but it may take another few months for the markets to reward our patience. In the meantime, we’re here for you! Call or stop by any time to share your questions, concerns, or suggestions. Some of the worst days in the stock market actually happened in September: the 9/11 attacks and 2008 financial meltdown, for example. 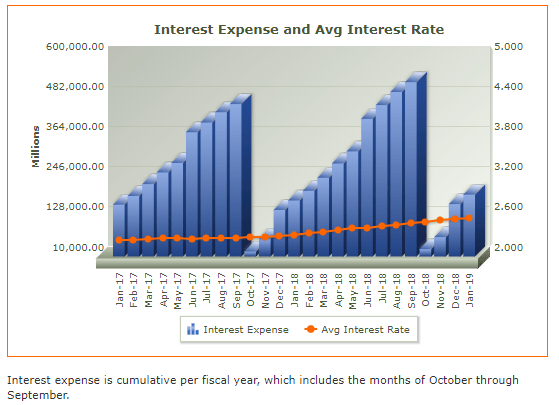 More often than not October has been a transition month, representing a buying opportunity for long-term investors able to endure some turbulence in exchange for future profits. Here’s the question for this past October: If the economic data was strong, why was the stock market so bad? Market commentators have plenty of possible answers for why global stock markets dropped off a cliff in October: escalating talk of trade wars, possibility that central banks will increase interest rates too high and stall the global economic recovery, uncertainty about the outcome of the U.S. midterm elections, high stock valuations, political disruptions in Europe, and others. While all these are legitimate concerns, none of them were new to October. Why did investors react so strongly? 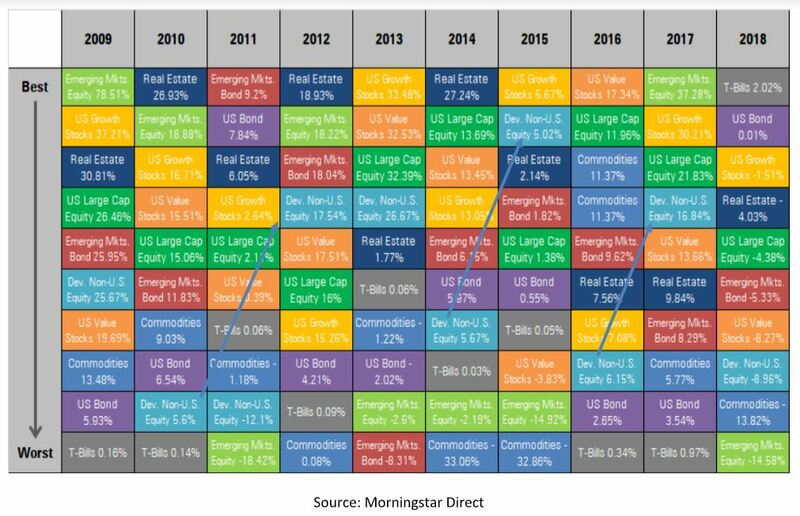 To better understand the U.S. market landscape, let’s take a minute to review where we’ve been so we have more perspective on where we might be going. No matter what the reason for October’s fall, what really matters are the decisions we make now that the market has stabilized. Is it time to sell before the next shoe falls? Or buy and ride the rebound…assuming there is a rebound? Each investor has to decide for themselves how much risk they can handle in pursuit of returns, but at Warren Street Wealth we’re holding on tight and buying into the weakness. International markets look cheap relative to the U.S.
All that being said, nobody likes to see negative numbers, investment professionals least of all. As one of our clients told me the other day, “No matter the explanation, down is bad. The only thing that helps is up.” Our job at Warren Street Wealth Advisors is to honestly evaluate our investment decisions, make course corrections when needed, and hold the line otherwise. It’s been a rough market in the U.S. and even worse internationally, but the value is clearly there. We’re staying the course and watching for opportunities to buy into markets that have been beaten down unnecessarily. We don’t know how long it will take for these cheaper sectors to recover, but we want to be there when it happens. We hope you’ll be there with us. 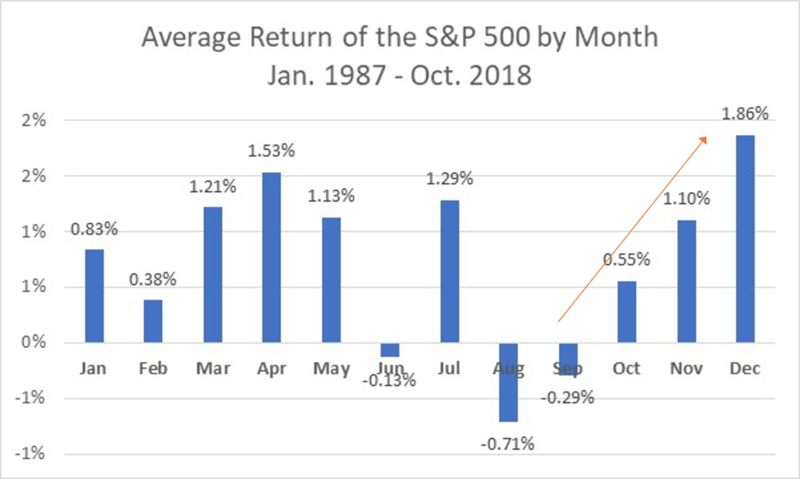 Referring to the average monthly returns in the table, if you invested $1,000 in the S&P 500 when the market opened in January and earned the average monthly return compounded monthly, you would end the year with $1,090 or a 9% return. If you had an additional $1,000 to invest and knew what the future monthly returns would be, when should you buy more stocks to maximize your dollar-weighted return?